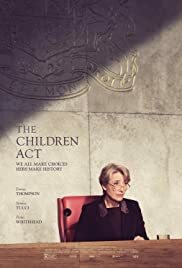 The Children Act movie is an English movie that shows Fiona Maye (Emma Thompson), a brilliant judge in UK who is known as a brilliant “My Lady” in the court room. While she is good at her job being a judge, yet at the same time lost the feeling of love and affection to her husband who constantly asking for romance and having a great time with her. Her work used to be her reason why she can’t even give quality time with him until one day, her husband seriously asking her permission to have an affair with other woman. Considering that her husband is a good husband she just fix the issue right there and then. Later on Fiona is facing a new case about a family who has son hospitalized due to leukemia but the boy and his family is a Jehovahs Witness’ believer which follows their teaching that blood transfusion is sin against God. Because of that, Fiona Maye must decide as judge to save the boy from the illness, although the boy won’t allow the transfusion to happen because of his beliefs. Furthermore, Fiona constantly sees the boy in the hospital due to the fact that the boy could not go to the court. Fiona Maye was impacted by the boy’s trust on her. The movie is totally amazing for a drama and good movie.